Following a brief and unexpected visit from the pesky injury bug, the 12-bout roster for “UFC 144: Edgar vs. Henderson” is once again complete. The event takes place Sunday, February 26th inside Saitama Super Arena in Saitama in order to accommodate a Saturday, February 25th 10PM ET/7PM PT start time in North America. The main card airs live on pay-per-view. Still no word from the UFC on how the seven preliminary scraps will be made available for viewing. 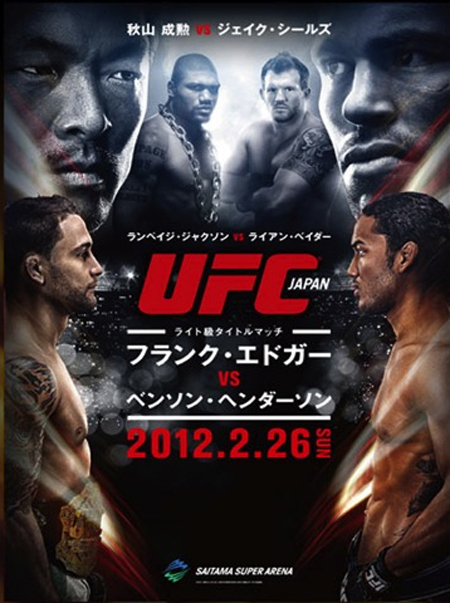 The show features a lightweight title tilt between champion Frankie Edgar and Benson Henderson. Light heavyweights Quinton “Rampage” Jackson and Ryan Bader will serve as the night’s co-main event.